There’s a big change coming in Drupal, and we’re here to guide you through what’s new in Drupal 8. We attended the Drupal 8 launch party at the Drupal Hub in Sunderland Software Centre recently, and saw Adam Hill speak on the changes and additions to Drupal 8 at Drupal North East here in Newcastle’s Campus North last week. So, what’s new and important for Drupal website owners and users at the moment? Our guide to Drupal 8 takes you through the changes to Drupal, and advice on migrating to Drupal’s newer version. The first thing to note is that Drupal 6’s long term support ends on 24th Feburary 2016. That means no security advisory notes and updates from next February – time to upgrade if you haven’t already! There’s a post on Drupal.org on Drupal 6’s end of life if you’re after a little more information on Drupal 6’s demise. If you were expecting a huge visual change for Drupal 8: you’re about to be disappointed! Whilst the structure that supports Drupal has changed vastly for this version, the administration panel and default Drupal theme feel very familiar! There has been a change to editing screens, though: the options previously below the main content field are not situated alongside it. A little like (dare we say it? Oh, go on then) WordPress. This small change should make a big difference to those who work on Drupal website content on a regular basis. It’s also worth noting that the rich text editor tool is installed and enabled by default: a big bug-bear for many in Drupal 7! 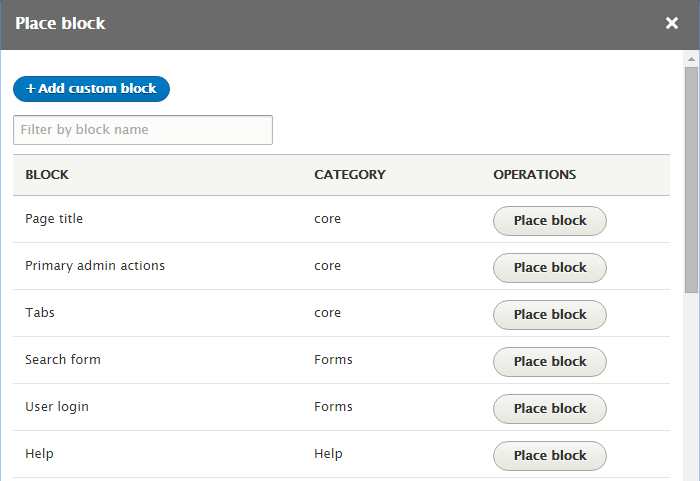 And many of you will be glad to hear the overlay feature in Drupal 7 is no longer there! Improved administration navigation toolbar: so much better, by default! Improved management for blocks (see screenshot below): this was previously quite fiddly! It’s not just functionality that has improved: Drupal have surpassed themselves in providing detailed documentation early on. This improved documentation should mean less of a headache for those pioneering web developers and website administrators looking to use Drupal 8 early on! This should mean that Drupal 8 is speedier out of the box, which can only be a good thing! The biggest change (for Drupal developers, at least!) is that Drupal 8 is built on the Symfony framework. This means that other web developers with no prior Drupal experience can now contribute to Drupal more easily. This should see the Drupal community grow even larger and stronger: excellent news for everyone all round! When should you upgrade to Drupal 8? As you read above, Drupal 6 support is withdrawn in February 2016, but Drupal 7 still has a long while before it is withdrawn. In our opinion, Drupal 8 is ready for use of small scale brochure websites which only require pages and news/blog functionality. In time, the modules for added functionality that made Drupal so successful to date will arrive in Drupal 8. Until then, it’s worth considering holding off on building anything other than simple websites in Drupal 8. And we can’t wait to do just that when the time is right. We hope you’ll agree Drupal 8 looks fantastic!